We’re extending our August Giveaway, yeah! So hurry, send in your babe’s cutest BabyLegs pic if you have not done so. New stocks of BabyLegs have arrived including a NEW style: Jester, fun diamond shape pattern in fresh green. You’ll be spoilt for choice with 40 styles of BabyLegs in stock at itsy bitsy ME! Can't get enough of our cutest BabyLegs? Now you can add one more to your babe’s collection, absolutely free! For the month of August, we’re giving away two free BabyLegs, our top selling product, to two very lucky winners. Simply email a photo of your babe in one of his/her favourite BabyLegs with your babe’s name, age and your name accompanied with a short comment/feedback on your experience of using the BabyLegs. Email your entry to info@itsybitsyme.biz. 2 winners will be randomly selected. Results will be posted on lollipop days on 27 August 2008. Winners will be notified by email. 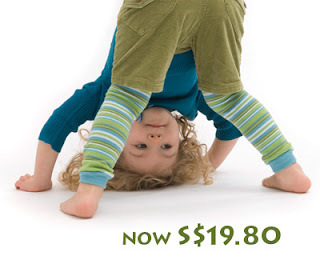 All our BabyLegs are going at S$19.80 per pair only for the month of August. Free registered mail service if you purchase more than three pairs.